While on the outside scarves and gloves are our friends, on the inside we’re actually looking for similar warmth and a feeling of comfort and relaxation. A COZY HOME LIES AT THE HEART OF OUR DESIRES. 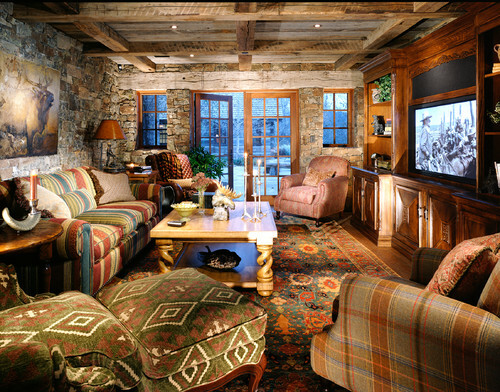 Rustic Home Theater by Bozeman Architects & Building Designers JLF & Associates, Inc. So today I’d like to share with you 4 tips for how to get the look and feel of a cozy home. Use those colours on the walls, as fabrics for curtains, throw pillows, or even generally for choosing furniture. The more warm colours you’re going to use, the cozier the space will feel. Mixing textures gives an instant gratification for the eyes, but also, it will bring tactile pleasure. Whether you’re in contact with the furniture, the textile, or even when you lean against a wall, it will feel good under your skin. An armchair that you just want to sit in and rest your arms on will be a much better setting for reading a book than one that scratches your back or makes you feel kind of bleh. The addition of soft blankets that make you want to touch them and wrap up in them will score you some extra cozy home points. There are all sorts of different types of lighting that come with a different purpose attached to it. What is good for cleaning might not be the best source of light for creating a cozy atmosphere. That’s why you should look around your home and think of the places where you could introduce some lighting that creates a cozy atmosphere. Consider using dimmed lights, candles, bulbs that give yellower light. All of the above will work brilliantly when you place them in a strategic place. Think of a lighting source not too far from the place where you spend your time relaxing (but not directly in this spot, it’s better if your atmosphere lighting is mostly visible on the peripherals of your vision). I have a set of lights that was originally meant as Christmas lights. 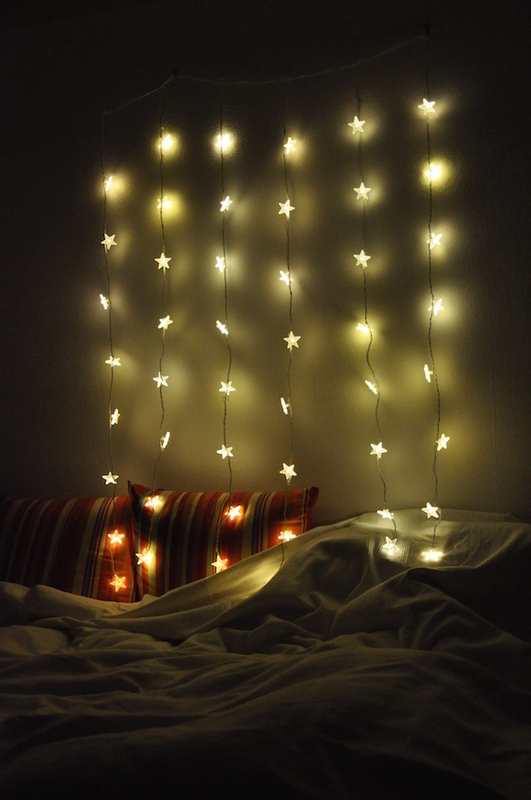 It’s shaped as 6 strings of stars hanging like a curtain. I bought them in IKEA many, many years ago (I’m sometimes surprised they still work!) and they have travelled with me to each of my many homes. For me personally, this is the thing that makes me feel like I’m at home. Even though they were originally meant as Christmas decoration, now they hang at my place all year round. And I turn them on whenever I’m craving some coziness after it gets dark. Those were my cozy lights in the house in Vienna back in 2011. The picture was taken right after I finished unpacking and turned them on for the first time there. It’s things like that – things that speak to us, have a history or some sort of sentimental value – that make us feel like we’re truly at home. Real coziness is not just about colours, materials and furniture, it’s also about what the space means to you. (CLICK TO TWEET) Familiarity, objects with personal meaning and being able to fully relax play an equal role in making you feel cozy and truly at home. Now, I’d like to hear from you. Do you have any objects in your life that make you feel cozy and like you’re at home? Are there any stories related to them? Thank you so much for reading and if you liked this post, please share it with your friends. ← Happy new year! Do you have a word for this year yet? Lovely article! I always feel so down in winter — great to get some ideas to make my space cozier! Love the star Christmas lights, Kat. I never think about lighting enough when decorating. Great tips! I love what you said about familiarity. Having a lot of art on the walls (like…a lot) makes me feel cozy. It’s a version of clutter that makes me really comfortable. That and fire. We had a wood-burning stove and now a pellet stove. Just the site of a live flame is so nice. Oh yes, fire adds to the feeling of coziness! I love those lights! And the tips on colors. Sweet! This is so near and dear to me right now because I utterly hate my apartment. I’d been planning to move a year ago so I never decorated it and then my plans kept falling through. I’m finally giving my 30 day notice in a few days and I’m going to employ these tips to finally feel at home in my new place. I’m so happy for you Sophia. Enjoy your new home! Kat, I just realized this is pretty much how I think when I try to paint from a true, loving, relaxed mindset. Isn’t it funny? I try use warm colors, work on textures, nring in personal experiences… Thanks for the post! Oh that’s really interesting, Maria!